How do I view hidden files and folders? - Ask Leo! By default, Windows hides certain files and folders. We'll look at how to change the setting to display hidden files and folders in Windows Explorer. I have my old Outlook .pst file on a flash drive, but I cannot get it to my hard drive. The location of the newly created Outlook .pst file is in the location – c:\Users\Username\AppData\Local\Microsoft\Outlook – but when I try to step into that location, there is no “AppData” folder. What am I missing? Or perhaps it’s trying not to confuse you with too much data. Or maybe it’s trying to protect itself from you. You and I, we know what we’re doing, so we’ll tell it to stop. Windows1 has a “hidden” attribute for files and/or folders. When a file is set to be hidden, many programs simply do not display its existence. In Window’s defense, there are files and folders that generally shouldn’t be played with, or that may simply cause confusion. I can understand why Windows might elect to hide them by default. On the other hand, sometimes we really do want to see them, as in this case. Fortunately, for Windows Explorer at least, there’s a simple setting. And if Windows Explorer isn’t your thing … well, there’s always the Windows Command Prompt. Here’s a view of “C:\Users\LeoN” on my machine. You’ll note there’s no AppData folder. 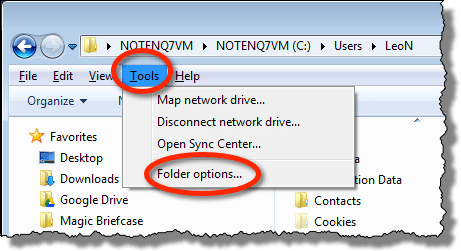 In Windows 7 and prior, click the Tools menu in Windows Explorer (if the menu isn’t visible, press the ALT key and it should appear), and click the Folder options… item. In Windows 8 and later, click the View menu, the Options button, and then the Change folder and search options item. In the resulting dialog box, click the View tab. 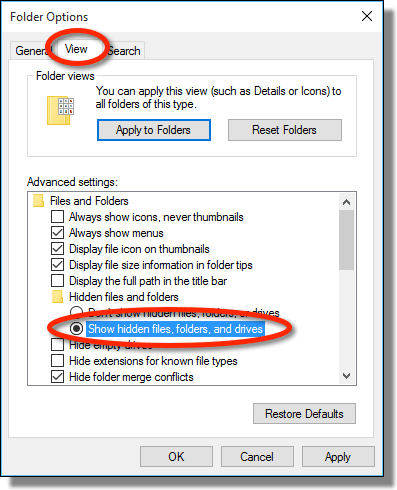 Change the setting to “Show hidden files, folders and drives”, and click OK. 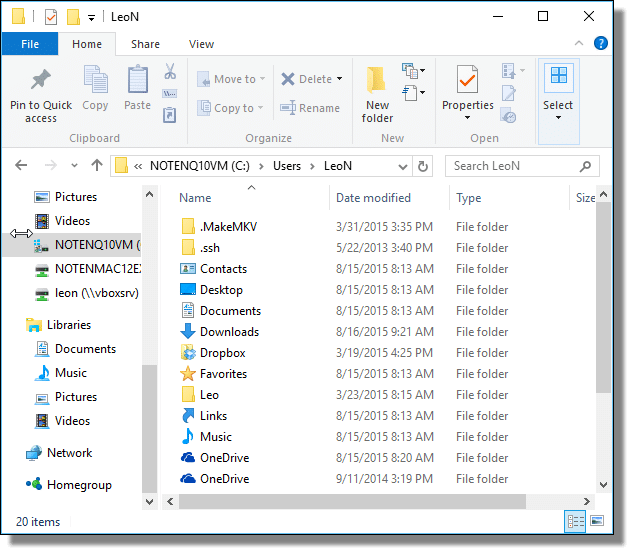 If we go back to Windows File Explorer, lo and behold, there’s the missing folder. If you look closely, you can see that the folder icon for the AppData folder is slightly lighter than the others. That indicates that the folder is marked as hidden. For the record, I always have “Show hidden files, folder and drives” set. I don’t feel I need Windows’ help to protect me from seeing files and folders on my machine. 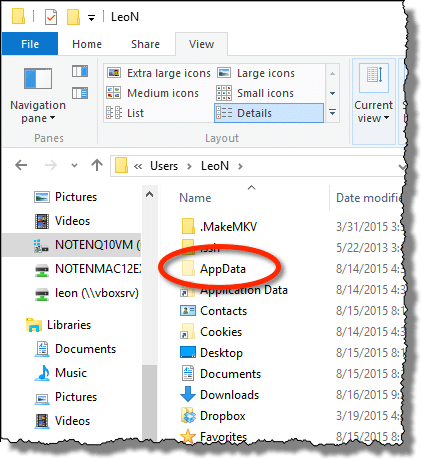 The bottom line: now that you can see the AppData folder, you’ll be able to copy your Outlook.pst file into the “Local\Microsoft\Outlook” folder you should find within. 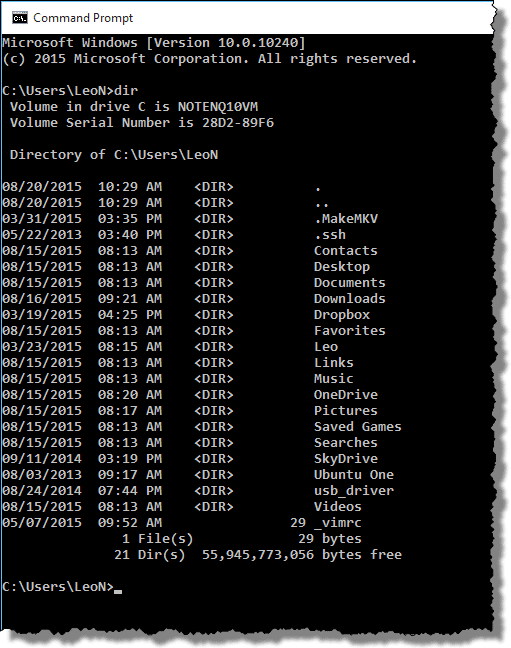 In Windows Command Prompt, use the “Dir” command to see the files in the current folder (also referred to as a directory). Once again, no AppData folder. There is no simple setting to always make the Command Prompt show hidden files. Instead, we add an option to the DIR command to tell it to display only the hidden files: dir /A:H.
Now, the AppData folder displays at the top of the list. 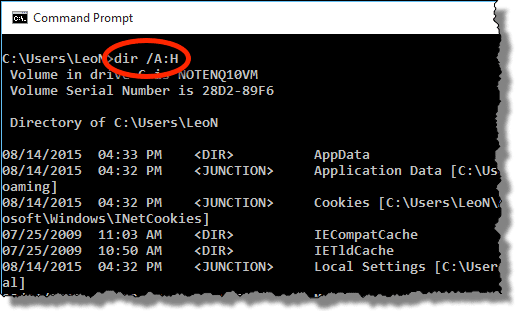 By default, the Command Prompt will display all hidden files, including system files and so-called “protected operating system files” – hence, the “<JUNCTION>” items and “NTUSER.DAT”, the file containing the user-specific registry. The result is the same as before: now that you can see the AppData folder if you’re command-line savvy, you can use command line tools to copy the file to the destination you need. 1: Actually, in Window’s defense, the concept was inherited from DOS, and probably pre-dates even that operating system. « Previous post: Why is Windows 10 being downloaded to my machine? And how do I stop it? In XP, you do not get the when using the DIR /A:H option. Even if the folder is hidden, you can use the CD command to change to the hidden folder in DOS and it will work just fine and you can copy/delete files just fine. XCOPY can also copy files to a hidden folder. So, at least with DOS, it’s not really all that hidden. On XP, some of those directories are marked “system” rather than “hidden”, so “/a:s” would be needed. Or, to list all directories, “dir /a:d”, which will show system and hidden directories. Finally, to list *everything*, simply use “/a”, and will will list everything, regardless of attribute. Another option, if you know the path, is to simply type it into the address bar. So, using Leo’s example, at the point when “c:UsersLeoN” is shown, click within the address bar and append “AppData” and press Enter. Again, this only works if you already know the path. The first link in the list explains about how to show the extensions for known file types. I’m with showing hidden files/folders. I want to know what’s on my system. Microsoft, in it’s infatile wisdom, thinks it knows what good for us. In a XP CMD prompt, when I want to CD (Change Directory) to a SubDirectory, I often just type the key and the first letter of the SubDirectory I want to go to, then I use the Tab Key to TOGGLE through the names offered until I find the one I want to get to and then I press the Enter key. Hidden Directories are shown when I use my procedure. Sometimes I will want to get a Directory listing Sorted by Date/Time Order, when I do I type DIR/OD , and the screen still Pauses for me whenever the listing is larger than one screenfull. I have set the Environmental Variable DIRCMD=O:GNE/A/P on ALL my computers – MS-DOS 5.0, WIN9x, XP and Vista and it works on all of them at a command prompt.